S0571. 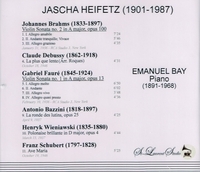 JASCHA HEIFETZ, w.Emanuel Bay (Pf. ): Debussy, Fauré, Bazzini, Wieniawski, Schubert & Brahms (the latter’s Sonata #2 in A). (Canada) St Laurent Studio YSL 78-078, recorded 1936-46. Transfers by Yves St Laurent.